Fertilizing canna lilies will ensure these stunners in your garden or your indoor containers will thrive and produce the most beautiful flowers and foliage. These plants love nutrients, so don’t skip this step in growing canna lilies. Doing it right means that you can enjoy flowers throughout the growing season. These beautiful flowering perennials are a staple in warm-climate gardens because they provide color, flowers, height, and pretty and striking leaves. They also pack a lot of punch for little effort. The flowers are fairly low maintenance, but they do require a good supply of nutrients to thrive. Because they love rich, nutrient-dense soil, it’s best to start with a good layer of organic matter. Use two to four inches (5-10 cm.) of compost or other organic material in your flower bed or containers to create a rich soil environment. 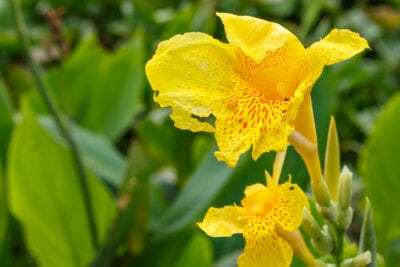 Canna lily fertilization is also important. Creating organic-rich soil is just a starting point. These plants benefit from regular fertilization to keep growing and producing flowers. Use a 5-10-5 or 10-10-10 fertilizer. For the former, the application rate should be about two pounds per 100 square feet and for the latter just one pound per 100 square feet. Make sure you follow each application with plenty of water. Knowing how much to feed canna lily plants is important, but so too is the timing and frequency. You should start fertilizing in early spring and continue to add fertilizer once a month. Make your last application of fertilizer about six weeks before you expect the first frost. This schedule of fertilizing will ensure you get blooms throughout the summer and into the fall. Providing your canna lilies with a lot of nutrients will guarantee you get tall, healthy plants that bloom regularly. To encourage flowering even more, deadhead individual blooms as the die back. Read more articles about Cannas.